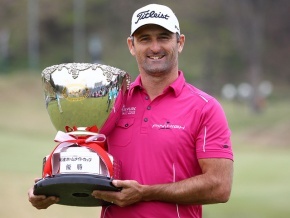 New Zealand golfer Mike Hendry has scored the biggest win of his career, claiming the season-opening event on the Japan Golf Tour and a $284,000 winner's cheque. It doesn't stop there - a Toyota car and a year's supply of rice are among the prize purse, not to mention a bunch of world ranking points in the race to the Rio Olympics. The former New Zealand No 1, who hinted at a return to form at the New Zealand Open in Arrowtown in March, stormed to victory at the 130 million Yen ($1.42 million) Token Homemate Cup, his first victory after two seasons on the lucrative Japanese tour. It's easily the biggest worldwide win by a Kiwi male golfer since Mark Brown (2008) and Danny Lee (as an amateur in 2009) won on the European Tour in successive years. Hendry not only pockets more than a quarter of a million dollars (26 million Yen, or $284,000 to be precise), but he will also shoot up the world golf rankings, from his current position of 395 to about 250. The jump would put him as the New Zealand No 3, behind Danny Lee and Ryan Fox, in the all-important race to claim New Zealand's two spots for the 2016 Rio Olympics. "One of the main reasons you play is to earn a living so this obviously helps a lot. It's a perfect start to the season," Hendry said as he digested the win. "I'm guaranteed a spot on this tour through till the end of 2017 now so having that security is great. Regaining the No 1 ranking in New Zealand is also a big goal of mine so this will help, too, and obviously if you can get to No 1 then things like the Olympics come into play. "Nothing bad can come from winning. It's awesome to get across the line." Hendry started the final round at the Token Tado Country Club in Nagoya at eight-under par, and three shots off the pace, but carded a sizzling seven-under 64 on the par-71 layout, which followed rounds of 67, 69 and 69 for a 15-under par total and a one-shot victory. He turned in two-under but struck five birdies on the closing nine holes, including one at the penultimate hole to claim a one-shot win. "I started well but just didn't make anything and I said to Josh [caddie Josh Carmichael] I just need to keep hitting greens. All of a sudden on the back nine the ball started going in from all over the place," Hendry said. "It was one of those days you need to have if you want to win these tournaments." Hendry can't keep the car because he is not a resident but he should get some money for it. As for the year's supply of rice: "I'm not sure what that's worth but it might be quite a lot over here." On Sunday night he planned to drop his rental car off, Skype his wife, Tara, and have dinner and a few beers with Carmichael, but the celebrations won't be long and loud - they board a plane on Monday morning bound for Shanghai, where Hendry is teeing up in the Volvo China Open, a European Tour-OneAsia tour co-sanctioned event starting on Thursday. "That's actually the tournament I've been targeting, and that remains a big target for me. I want to go there and do well, irrespective of how well this week has gone." Hendry put his early season success down to more "streamlined" practice. "I've got a young daughter a home so I don't want to be at the golf course all day, every day. I'm working more on the things that matter, and it seems to be working."